On Swimming with Alligators. | iamchrisgilmore. I once knew a young man who desperately wanted to go swimming. He found a little spot that seemed ideal. What he didn’t realize was that alligators infested the water. I tried to warn him that swimming in that particular pond was a bad idea. He told me to stop being so judgmental. This story never actually happened but illustrates a problem we have in our society: No one wants to be told anything that goes against what they have already set their mind on. We have made up our minds. We have followed our hearts. We don’t care what you say. So stop judging me. Now, do we have a judging problem in the world and in the church? Absolutely. Maybe we can address that in a future post. We must recognize that there is a difference between being judgmental and being concerned for a person’s welfare. One is rooted in pride and/or self-righteousness. One is rooted in love. If I told the young man who was swimming that he was an idiot for thinking he could swim in that pond, that would be judgmental. If I told him he was unwelcome at my church because we don’t like alligator swimmers, that would be judgmental. If I thought I was better than him because I don’t swim in ponds like that, that’d be judgmental. Warning him that the water is full of legitimate danger is not judgmental. Except those sayings are terrible advice. They are not helpful, nor are they healthy. Thinking like this will just get us eaten by alligators. Whether we care to admit it or not, sometimes we do things that are not in the best interest of ourselves or others. Sometimes we are shortsighted. Sometimes our priorities get out of alignment. Sometimes we are just ill-informed. Sometimes our heart leads us astray. We have all been there. We have all done things that come back to bite us or cause us pain or wound others. None of us are immune. It has happened before and it will happen again. We need people to help us when these things approach. We need people who can speak the truth into our lives. We need not be defensive. We need not feel judged. Yes, warnings and concerns need to be spoken lovingly. And sure, we won’t always agree on which things are dangerous. But we need voices that we trust to speak into our lives when we can’t see clearly. Or when we don’t even realize we aren’t seeing clearly. I have seen and experienced and caused destruction because I was unable to notice or too ignorant to care that the water I was swimming in was full of predators. I have seen marriages destroyed, futures derailed, fortunes lost, because what a heart wanted in one moment was the very thing that would devour it in the next. We can do better. We can rely on each other. We can listen, even when we don’t agree. We can pause and take into account what the people who love us think. We can seek outside counsel. We can search for truth and knowledge. We can be okay with people calling out to us in warning. 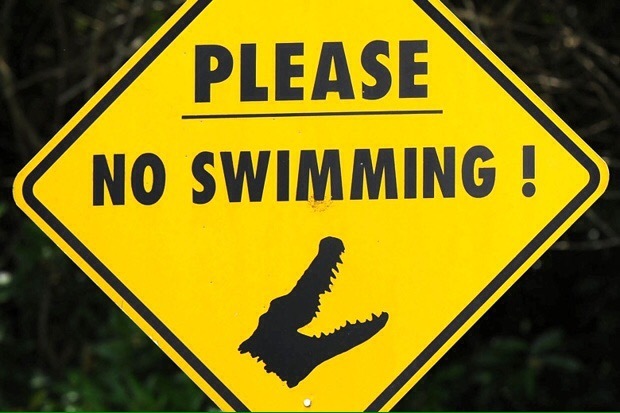 I won’t let my kids swim where there are actual alligators. It has nothing to do with controlling their behavior and everything to do with keeping them safe. Boundaries will help keep them from being eaten alive. And if the first few years of parenting have taught me anything, it is that they won’t always appreciate those boundaries. What I hope they understand long after they are old enough to decide which ponds to swim in on their own, is that my intentions were for their good. I hope they will always come to me knowing that my advice or rebuke or encouragement comes from a place of love and not judgement. I hope I am mature enough and self-aware enough to listen for those voices in my life. To not reject concern or write it off as judgement just because it goes against what I want in that moment. I hope the people around me love me enough to speak up when I go dipping my toes in gator infested water. I hope I can hear the love in their voices when they call out. Let’s allow others to help us. Let’s reject the idea that we always know what is best for ourselves. Let’s give people permission to hold us accountable. Let’s stop learning lessons the hard way. Let’s listen when people warn us that we are swimming in dangerous waters. For when they do it’s not judgement, it’s love. This entry was posted in Faith and tagged accountability, advise, community, judgement. Bookmark the permalink.